Vanguard and Betterment are two of the industries leading brokerage solutions specifically designed for long term retirement investing. Vanguard has been around a lot longer, founded with the purpose of providing mutual funds and ETFs at the bare minimum cost. Betterment has emerged much more recently, coming into its own within the past five years. They simplify the retirement investing process even more than Vanguard, while keeping costs lower than most other retirement investment alternatives, particularly those involving a personal investment manager. Both platforms have qualities which will appeal to different kind of investors. Here are some things to consider before setting up your IRA with one or the other. Vanguard prides itself on being bare-bones in its costs. Average user costs are .19% of the account balance, as of 2015. However, costs may be higher or lower depending on how often you buy funds and ETFs, how much you use Vanguard’s advisor service, and other options paid for a la carte. It’s not uncommon to see Vanguard users report monthly fees of .06%! That is usually for very simple allocations: 3 or 4 funds bought and never touched again, but it’s a great option for people willing to research their own funds for a long term portfolio. Betterment charges one flat fee, tiered according to how much you have invested. New users can start an account with no money at all, providing they are willing to pay $3 per month. New users who commit to contributing $100 a month pay .35% of their account balance per month. Lower monthly fees of .25% and .15% kick in at $10,000 and $100,000 respectively. 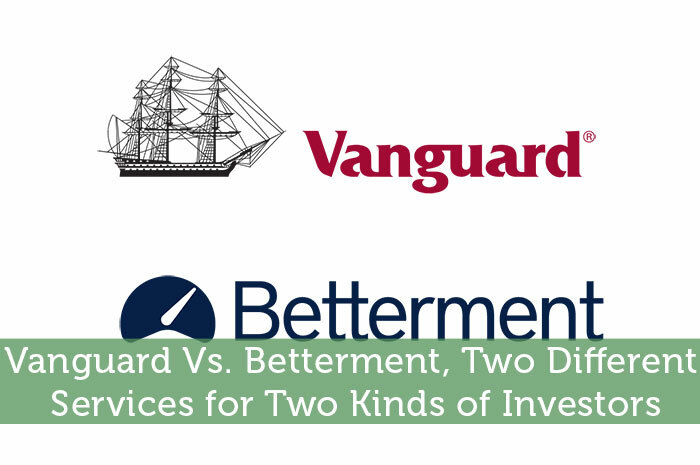 Here is where the differences between Vanguard and Betterment really start to become clear. Betterment’s motto is “set it and forget it”. It is meant to be an easy retirement investment solution that truly automates the process. As such, Betterment doesn’t offer the investor much in the way of detailed control. Investors select target dates for retirement and risk tolerance (portfolio balance of stocks vs. bonds). Betterment shows detailed stats of how each ETF performs, but the weight of each in the investor’s portfolio is determined by Betterment. Vanguard leaves all of this up to the investor. Investors research their own funds and take on all the responsibility for the long term performance of their portfolio. A Vanguard customer would likely point out that this allows the investor to truly learn about the ETFs they’re invested in, while saving money in the process. Of course, if you make a choice that you want to change later, you’ll pay more for the adjustments. Betterment likely won’t be the best choice for the sophisticated investor. Betterment doesn’t make it possible to allocate across accounts that are not managed by Betterment. Vanguard allows this. Betterment also doesn’t allow the direct transfer of securities into a Betterment account, just cash. This means that if you want to move securities that have appreciated greatly in another account, you’d have to sell them, then move the cash to Betterment. But are these behaviors that the average Betterment user is performing? For the most part, no. Betterment has been successful because they understand how much time and energy a certain kind of investor is willing to commit to retirement investments. While experienced or high net worth investors will do well to invest elsewhere, and will often find ways to lower annual investment costs by tenths or hundredths of a percentage, most new investors don’t have this kind of commitment, for better or worse. The choice is yours. If you want to get your hands dirty and dive into what retirement investments really mean, you’ll love Vanguard. In the end, it’s not even that hard to create a basic portfolio with a few ETFs, and you’ll pay less than you would at Betterment. Betterment actually buys their ETFs through Vanguard anyway! But if you don’t want to bother with it, Betterment is for you. They have a snazzy website that explains everything you need to know about your portfolio’s performance. They make an automated retirement plan easy. And in the end, your portfolio will probably perform about as well as your Vanguard account, because they would each contain many of the same funds. This is a very general guide, but it gives new investors what they need to know. If you are craving hands on control and many more details, go with Vanguard. If you want to build wealth for retirement but don’t want to think much about it, go with Betterment. Both serve the needs of different kinds of customers, and both are essential players in the retirement investment landscape.